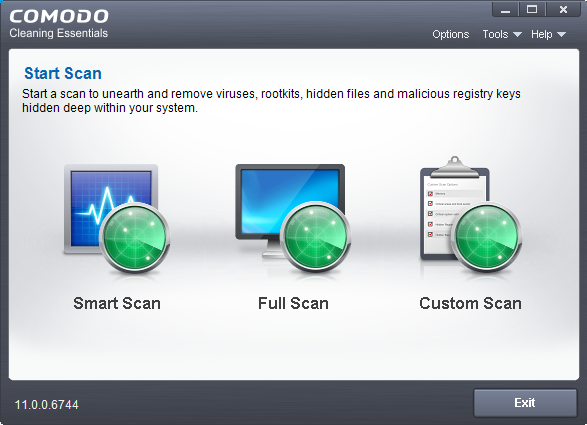 Malware scanner	- Fully customizable scanner capable of revealing and eliminating viruses, rootkits, hidden files and malicious registry keys hidden deep in your computer. When started in aggressive mode, CCE forcibly terminates all existing processes running under explorer, and explorer itself for fast and efficient scanning. This guide is intended to take you through the step-by-step process of organization, configuration and use of Comodo Cleaning Essentials application. Section 1, Introduction to Comodo Cleaning Essentials, is a high level overview of the solution and serves as an introduction to the main themes and concepts that are discussed in more detail later in the guide. Section 2, Scan your System, explains the various methods of scanning your computer. Section 3, Configure Comodo Cleaning Essentials - Explains how to configure the overall behavior of the CCE. Section 4, The Tools Menu – Explains how to use the tools in CCE. Section 5, Introduction to KillSwitch - is a high level overview of KillSwitch, a powerful built-in system monitoring tool and serves as an introduction to the main themes and concepts of KillSwitch. Section 6, Introduction to Autorun Analyzer - is a high level overview of Autorun Analyzer, a powerful tool to analyze and handle services and programs that were loaded when your system booted-up and serves as an introduction to the main themes and concepts of Autorun Analyzer. Section 7, Help and About - How to open the online help guide and find the version number and other miscellaneous details about the CCE application. Section 8, Use the Command Line Interface – Explanation on how to run various tasks of CCE application from Windows command line interface.